Do you live to far from one of our locations? Make an appointment for a consultation for our at home program. One on one counseling in the privacy of your home. You will have your own counselor counseling you via the internet one on one. You can ask questions and she will be answering you and following up with you on the internet or the phone if you prefer. You can call her anytime and she will be calling and emailing you on an on going bases. The Slim4life® At-Home Program combines a well-balanced food plan that is based on regular grocery store foods, delicious protein Slim Snacks, and our proprietary Weight Loss Aids. Our At-Home Program is structured yet flexible and provides up to 1,500 calories daily, along with being rich in vitamins and minerals and low in refined carbohydrates, fats and sodium. This program provides the balance; variety and moderation that you need to achieve your weight loss goal. Most importantly, you will learn and adopt new eating habits and behaviors that will enable you to control and manage your new healthy weight. 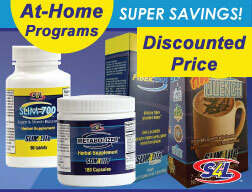 All Slim4Life® At-Home Programs provide the core of our program, plus a selection of our best selling products. Before starting any weight loss program please consult your physician. Purchase your 4, 6 or 10 week program here! Schedule your free At-Home weight loss consultation today!